In the interest of catching up, I have a few Christmas gifts that I completed last year (all at the last minute, true to form) to share with you, before this Christmas rolls around. Anyway, last Christmas Eve, I sewed these three items and completed a couple of other projects (more on those in upcoming posts). For our great nephew (oh, my, how hard it is to say I'm a "great aunt" at age 33 [aren't they usually about 85?]. 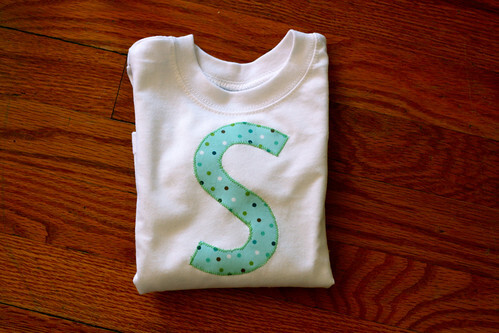 Well, I was actually 31 when this baby was born, but anyway, yes, my husband's oldest brother has a grandchild....), I made this cute applique initial shirt. A simple gift, but applique stuff is always so well-received. 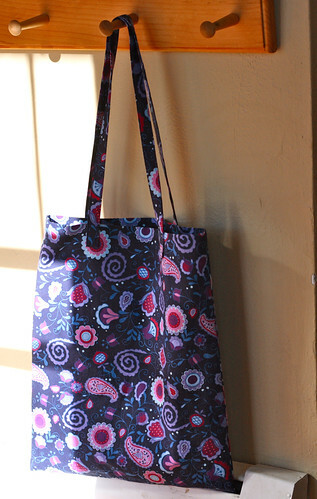 For my sister's oldest step daughter, I made this tote bag, which was intended to be for her piano music, although she has since stopped taking piano lessons. But purple is her favorite color, and Elisabeth still gets so much use out of hers, so I'm sure it comes in handy. 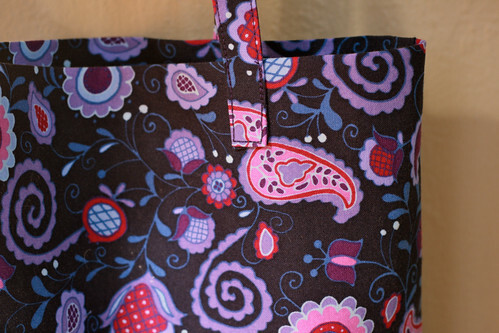 The pattern is the Ballerina Drawstring Bag (really a tote bag) from Simple Sewing with a French Twist (this was the second time I've made this bag; the first time was for Elisabeth's 5th birthday). I really like this pattern. It comes out looking very finished and professional for not a lot of work. 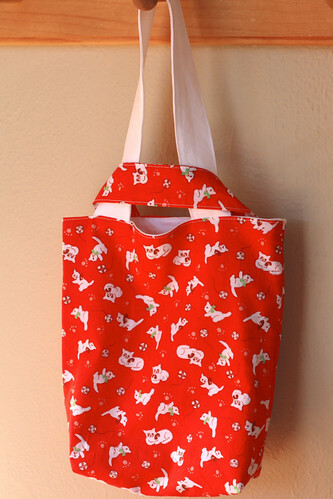 For my sister's younger step daughter, I made another Simple Tote from Bend the Rules Sewing. The last one I made went to her older sister (the one who got the purple tote this time) years ago, and I'd been hearing rumors that the younger sister wanted her own, so she got one! 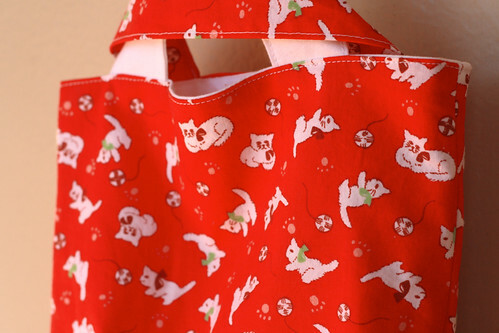 I totally love this red kitten fabric! Altogether, these were easy, relatively quick gifts that all come out looking pretty polished. The best kind of gift, I think!